Give your CRM application or Lead Management tool a decent opportunity to deliver the results your dealership wants... Stop using the basic and in some cases, worthless email templates it came with! 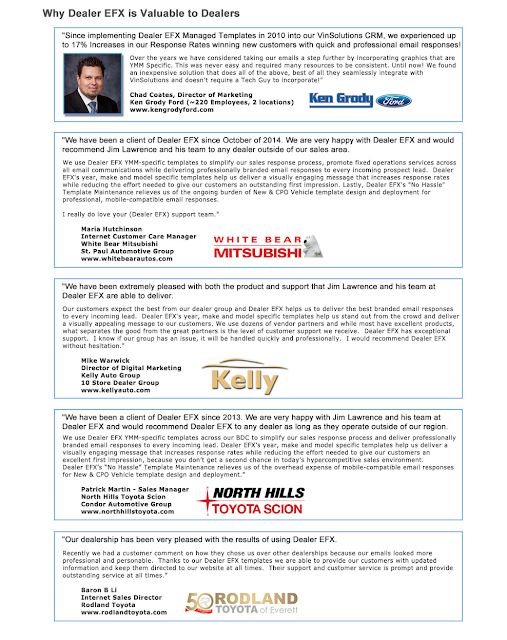 The dealer testimonials and references shown below are just a few of many that we have seen... Instead of relying on your own people to update every model line specific email templates, including current incentives and your own dealership's promotions, for a low monthly cost, Dealer EFX will keep all your templates current, without anything required of you or your team. Your email library can become your greatest marketing advantage! Dealer EFX keeps them current, compliant, OEM approved, integrated within your CRM and most importantly of all... effective! The Dealer EFX email templates are now organized in your CRM application by customer touchpoint as well... making it far easier for your BDC or Sales Team to choose the right template based on where the buyer is in the sales process at your store. Don't let your people send out poorly written and trashy formatted emails any longer... Get Dealer EFX and start sending emails that don't get blocked by spam filters and which create desire among car and service buying consumers to do business with your dealership!